Another Merit Badge for Liquid Alternatives? When the curtain came down on 2014, liquid alternative funds surprised a lot of people by outperforming hedge funds, their more experienced, more glamorous cousins. When the curtain came down on 2014, liquid alternative funds surprised a lot of people by outperforming hedge funds, their more experienced, more glamorous alternative investment cousins. After all, the reasoning goes, liquid alts are more constrained than hedge funds, so they should underperform. I disagree. The fact is that the competitive landscape has changed. Since 2008, a subtle shift has taken place among traditional hedge fund managers. Many now use less leverage, as little as 2:1, and many are investing in more liquid securities. In other words, many traditional hedge funds are beginning to look more like liquid alt funds. If imitation is the sincerest form of flattery, then hedge funds are acknowledging that liquid alts may be onto something. One big difference remains—the traditional hedge fund typically charges 2-and-20% in management and performance fees. Liquid alts were designed to appeal to retail investors who want the potential of hedge fund-like performance without hedge funds’ famous appetite for risk. In general, liquid alts are more transparent, use less leverage and, importantly, offer daily or weekly liquidity. Less risky and better performing? It sounds like a beer commercial. The reasons for outperformance varied from strategy to strategy. The relative value and event-driven classes, which are mostly invested in debt instruments, outperformed their hedge fund index counterparts by the biggest margins. That gap likely stemmed from the fact that liquid alts were invested in more senior, less risky debt instruments than were traditional hedge funds. In other words, the more aggressively hedge fund managers tried to hedge against bonds, the more likely their performance suffered. Event-driven hedge funds likely suffered from events—mergers, acquisitions and the like—that failed to occur. The equity hedge class, including long-short and market neutral strategies, outperformed their hedge fund index competitors because they are more U.S.-oriented and the U.S. stock market was the market to be in for 2014. 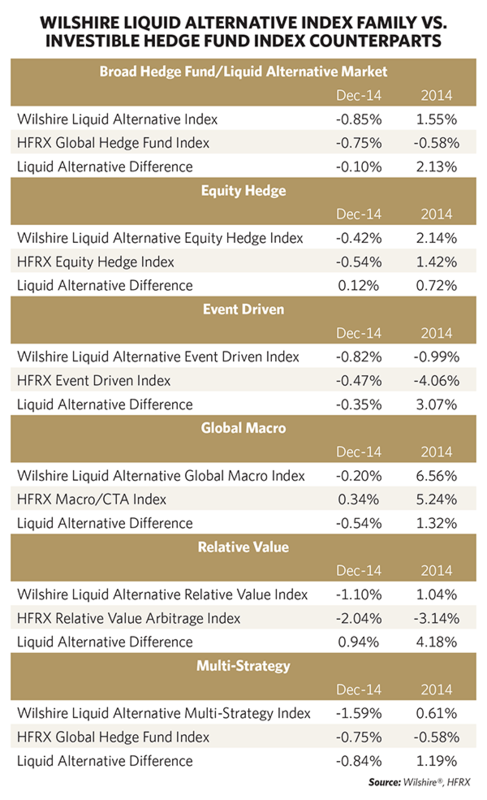 Indexes of liquid alt global macro and multi-strategy funds (a fund of liquid alt funds) also did better than their hedge fund index counterparts, according to Wilshire. 2014 was hardly a complete victory for liquid alts, however. Though they beat their hedge fund counterparts, liquid alts underperformed long-only bond and equity strategies, as bonds gained 6% last year, as measured by the Barclay Capital Aggregate Bond Index, and the S&P 500 Total Return Index was up 14%. Moreover, liquid alternatives are not for everyone. Liquid alternatives, like any investment, involve the risk of loss of principal, and they may be more volatile due to speculative trading strategies. Despite their 2014 performance, I do not see any dampening of enthusiasm for what industry observers are now calling a disruptive innovation in investing, one whose impact could rival the introduction of ETFs a decade ago. I say that for a couple of reasons. First, as of press time, the bull market rally is celebrating its six-year anniversary in March. Investors are even more nervous now about a stock market correction and a seemingly inevitable rise in interest rates. Second, liquid alts are attracting strong interest from institutional investors. As long as hedge funds outperformed their competitors, pension funds and other big investors could justify the hefty fees, but their 2014 performance puts pressure on pension funds, making it harder for the smart money to keep looking smart.